charge has withdrawn his case in Worcester Superior Court. 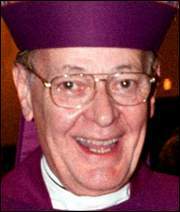 Sime M. Braio filed suit against Bishop Rueger in July 2002. The Diocese of Worcester responded to the suit with a strong denial and Bishop Rueger has remained in his post. Mr. Braio filed his motion on Wednesday and Judge Tina S. Page granted the dismissal. In the brief, handwritten motion, Mr. Braio said, "I am doing this willfully and voluntarily. No threats have been made against me. Trooper Tom Greene of Auburn told me to do this." Trooper Greene heads District Attorney John J. Conte's investigative unit. Calls to Trooper Greene were not returned last night. Yesterday, Mr. Braio's former lawyer, Daniel J. Shea of Houston, accused state police of coercing his client into a dismissal. "There's going to be a tort claims act filed against the Massachusetts State Police for tortiously interfering with my relationship with Sime Braio," said Mr. Shea, who was fired by Mr. Braio in August. Mr. Conte, however, dismissed Mr. Shea's accusation as false and said the trooper would have been in contact with Mr. Braio because Mr. Braio is a victim whose allegations are being investigated by his office. "Tom Greene told Sime Braio, in furtherance of his motion to dismiss without prejudice, that he could tell the judge that the state police had not completed their investigation," Mr. Conte said. He could not say under what circumstances the trooper and Mr. Braio's conversation about the civil case may have come about. "Sime is the victim," he said. "We talk to all victims." Mr. Braio also withdrew slander charges against Monsignor Thomas Sullivan and Assistant District Attorney James J. Reagon, even though he had already dismissed the charges against Mr. Reagon in July. Mr. Braio had filed a defamation suit against Monsignor Sullivan, the diocesan chancellor and liaison to the district attorney's office. Mr. Braio alleged that Monsignor Sullivan spread misinformation within the diocese that Mr. Braio had HIV. Mr. Braio later sought an HIV test, which came back negative, a result that he made public. He had alleged that Mr. Reagon told Monsignor Sullivan that Mr. Braio was HIV positive. Monsignor Sullivan said in pretrial testimony that Mr. Reagon provided him with that information. Mr. Reagon denied making the statement. Mr. Braio's lawsuit alleged that Bishop Rueger, then a parish priest, began sexually molesting him in the early 1960s when he was 13. The suit alleged the abuse resulted in behavior that landed Mr. Braio, now 53, in the former Lyman School for Boys in Westboro. The diocese kept Bishop Rueger in his post even as it removed several priests who also had been charged with sexual abuse during the past two years. In September, Mr. Shea withdrew from the case while charging that Mr. Braio was being coerced into a secret settlement. Mr. Shea filed for intervention in the case and a hearing is scheduled for Dec. 3 in Superior Court. Mr. Braio had named the Roman Catholic Bishop of Worcester, a corporation, in the suit, but the corporation was dismissed as a defendant by Superior Court Judge Leila R. Kern on the same day Mr. Shea withdrew from the case. In a statement released by the diocese yesterday, Bishop Rueger said, "I am deeply grateful to Bishop (Daniel P.) Reilly for his wonderful words and his enduring support during this difficult time. I am grateful to my brother priests, my sisters in religious life and all the wonderful lay people whose prayers and kinds words have sustained me. May all of us continue to heal our church and one another." Also in a statement, Bishop Reilly said, "This ordeal will not diminish our ongoing diocesan program to reach out to those who have been abused and are seeking healing." Bishop Reilly sent a letter to diocesan parishes saying he was, "very grateful for your prayers and support for Bishop Rueger, and for the encouragement given to him by thousands of people throughout the diocese and beyond." Diocesan lawyer James G. Reardon said he had no plans to file any countercharges against Mr. Braio. Monsignor Sullivan had accused Mr. Braio of extortion, saying he threatened to file suit against Bishop Rueger unless he was paid a sum of money by the diocese. "I'm glad the case is gone," Mr. Reardon said. "It was a very difficult thing to have to endure. Bishop Rueger is very relieved and pleased that he's been exonerated." Mr. Reardon said the timing of the dismissal caught him by surprise. "The diocese never paid any money on either claim, which I think is appropriate," he said. Mr. Shea, however, said he believes the case is anything but over. "As of July of this year, Sime Braio had already dismissed without prejudice the case against James Reagon and he told me he did so under coercion from a state trooper," Mr. Shea said. "He's now admitting that he's being told what to do by state Trooper Tom Greene. I'm going to be demanding some answers from the state of Massachusetts on why a state trooper is practicing law without a license. I've never seen anything like this in my life. Thank God it's in writing." In an interview last night, Mr. Conte called Mr. Shea's allegations "absolutely false." He said his office's investigation into Mr. Braio's allegations against Bishop Rueger is ongoing, but he expects it to be completed soon. "Hopefully, it's going to be completed very shortly," he said. "There are some loose ends, but up to now, the allegations have not been corroborated. (Mr. Braio) asked us to look into certain things and that is what we are doing."